You’ve made a huge investment in your house—maintaining and improving it should be a priority. Fortunately, there are ways to upgrade your home right now that are fairly inexpensive, will cut down your maintenance costs and increase the value of your home. Here are four home improvement projects you can take on right now to save yourself money in the future. Americans spend anywhere from 5 to 22 percent of their after-tax income on energy bills according to the American Coalition for Clean Coal Electricity. Not only that, the Energy Information Administration is projecting the average U.S. residential electricity price to rise by 3 percent in 2018; it’s clear that homeowners will need ways to keep their energy costs down. Thankfully, there are a lot of ways to make your home more energy efficient. The trouble is knowing where to start. The first step you should take is getting a home energy audit. During this inspection, a trained auditor will analyze your past energy bills, inspect your entire house to see where you’re wasting energy and present the findings to you in a comprehensive report. This report will show you exactly what you need to do to improve the energy efficiency of your home. Some common energy wasters are air leaks and drafts, energy-intensive appliances and even electrical safety issues. With the results of your audit, you’ll know exactly what to upgrade first to save money on your energy bills. A home energy audit typically costs between $300–$500, but if you fix the issues it identifies, it can save you up to 30 percent on your monthly energy bill. Estimates from the Environmental Protection Agency show that homeowners can save an average of 15 percent on cooling and heating costs—or 11 percent on their total energy costs—by sealing air leaks. Common sources of air leaks and drafts include exterior doors, windows, fireplaces, ducts and vents and poor insulation in attics. For less than $30, you can add caulking to your windows, doorframes and other potential leaks. Adding insulation to your attic can be a DIY project, costing you about $15 per roll of insulation, whereas hiring a professional to do it costs an average of $1,358 per HomeAdvisor data. If you have the skills, you can even install energy-efficient double-paned windows yourself; having a professional do it will cost an average of $4,793. Whether you have a professional handle these projects or you tackle them yourself, at a 15 percent reduction in energy costs, sealing air leaks will pay for itself in just a few years. Gutters and downspouts that allow melting snow or rainwater to easily flow away from the structure are important for protecting your home against leaky roofs, mold, rotten wood, insect and critter infestations, cracked foundations and other costly problems. At a bare minimum, you should look to clean your gutters and downspouts at least twice a year—once during the fall and again during spring. While it’s possible to do this yourself to save some money, it’s highly recommended that you hire a professional. According to HomeAdvisor, the average cost of a gutter/downspout cleaning is $150. This cost can vary depending on how long your gutters are, how high the roof is and other factors that could complicate the job. If that sounds expensive, you should know that the average cost to repair a cracked foundation is $4,001, while fixing a leaky roof costs Americans an average of $867. The math is clear: It’s worth investing in clean, well-maintained gutters. Change the filters every one to three months. Clogged filters force your system to work harder to keep your house warm/cool. 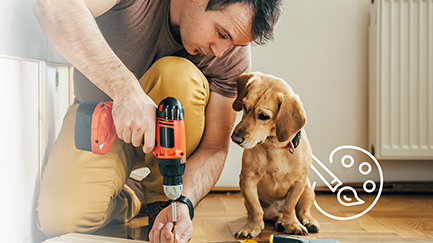 Getting your filters changed yearly can cost anywhere from $20–$200 depending on whether or not you have pets, the quality of filters you purchase, how many ducts you have, etc. Get a programmable thermostat. With a little pre-programming, these “smart” thermostats can adjust themselves to the optimal temperature for a given time of day based on the size of your house, when occupants will be inside, and a variety of other factors. A properly programmed thermostat can save you up to $180 per year in heating/cooling costs. Seal all air ducts. ENERGY STAR found that you can improve the efficiency of your HVAC system by up to 20 percent by sealing your air ducts. Get a regular check-up. Getting a check-up for your HVAC system by a licensed technician will cost you about $100-$150. But if this prevents a small problem from damaging your system during a sweltering summer or freezing winter, it will be well worth it from a cost and comfort standpoint. Home improvement doesn’t only have to be about major renovations. These four projects will take you less than a day for each one, and all of them will improve the overall comfort of your home while saving you money.